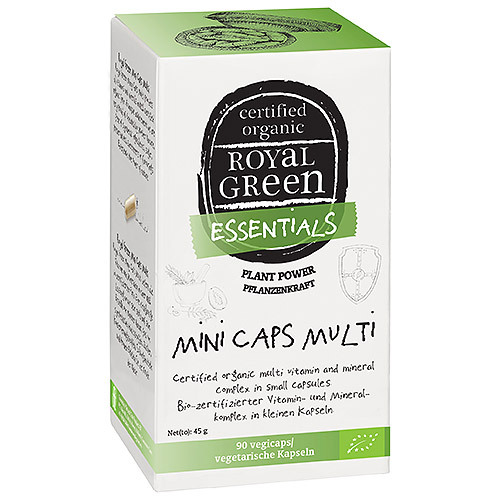 Royal Green Mini Caps Multi provides vitamins and minerals in 100% certified organic form. Free of synthetic ingredients, preservatives, sweeteners or flavourings. Suitable for vegetarians and vegans. Experience the power of nature! Red algae* (Lithothamnium calcareum), organic plant mix* (holy basil extract [Ociumum tenuiflorum], amla extract [Emblica officinalis], guava extract [Psidium guajava], curry extract [Murraya koenigii] and lemon extract [Citrus limon]), capsule: HPMC, sea lettuce extract* (Ulva lactuca), spinach* (Spinacia oleracea), amla extract* [Emblica officinalis], knotted wrack* (Ascophyllum nodosum), cultivated mushroom* (Agaricus bisporus), sunflower oil* (Helianthus annuus), anti-caking agents: magnesium carbonate and silicon dioxide. 1-3 vegicaps per day, preferably with a meal. As with every dietary supplement: consult an expert before use in case of lactation, illness or medicine usage. 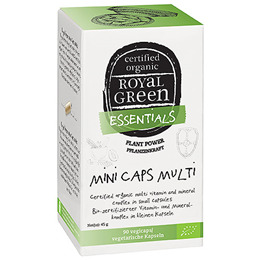 Below are reviews of Royal Green Mini Caps Multi - 90 Vegicaps - Best before date is 22nd May 2019 by bodykind customers. If you have tried this product we'd love to hear what you think so please leave a review.